The PMW-EX1 records onto memory-based SxS ExpressCard media. 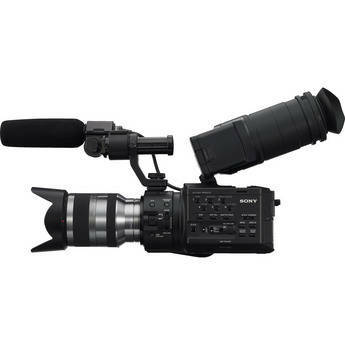 It utilizes SxS PRO memory cards and a non-linear XDCAM workflow. It carries the CineAlta 24P brand with multiple frame rate recording capability such as 59.94i, 50i, and native 23.98P, as well as being 1080i/720P switchable. There is also a choice of a 35Mb/s High Quality mode or a 25Mb/s, HDV 1080i compatible mode. To take advantage of this high performance recording capability, the PMW-EX1 uses an all-new imaging system consisting of three ½-inch type CMOS sensors, each with an effective pixel count of 1920×1080 to produce images in full HD resolution. 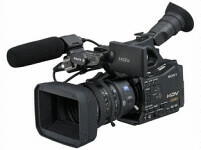 In addition, there’s a purpose-built Fujinon Professional HD ½-inch 14x lens and a unique dual focus ring mechanism. To maximise recording time, the PMW-EX1 has two memory card slots which means with a pair of 16 GB SxS PRO memory cards, it can record up to 140 minutes of HD footage. Notes: Accessory kit available as separate checkout; includes 2 x 8GB CF card; Hoya lens 2-filter kit with warming filter, polarizing filter; Petrol viewfinder screen shade; Sony MRU; iLink cradle for Sony MRU; Anton Bauer Elipz long-life battery pack kit.